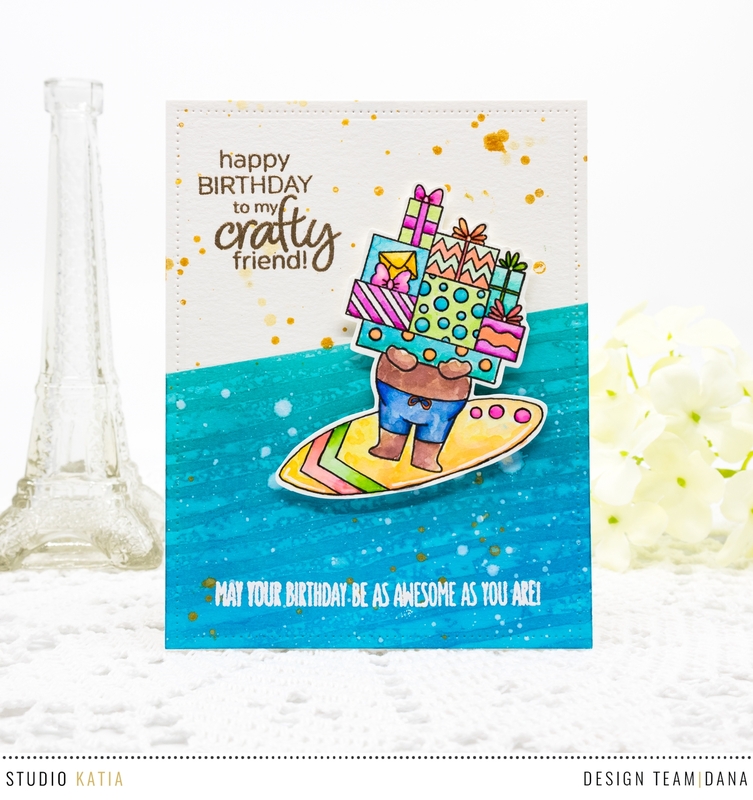 I'm sharing two birthday cards featuring Studio Katia Kobi Bearing Gifts Stamp Set today. 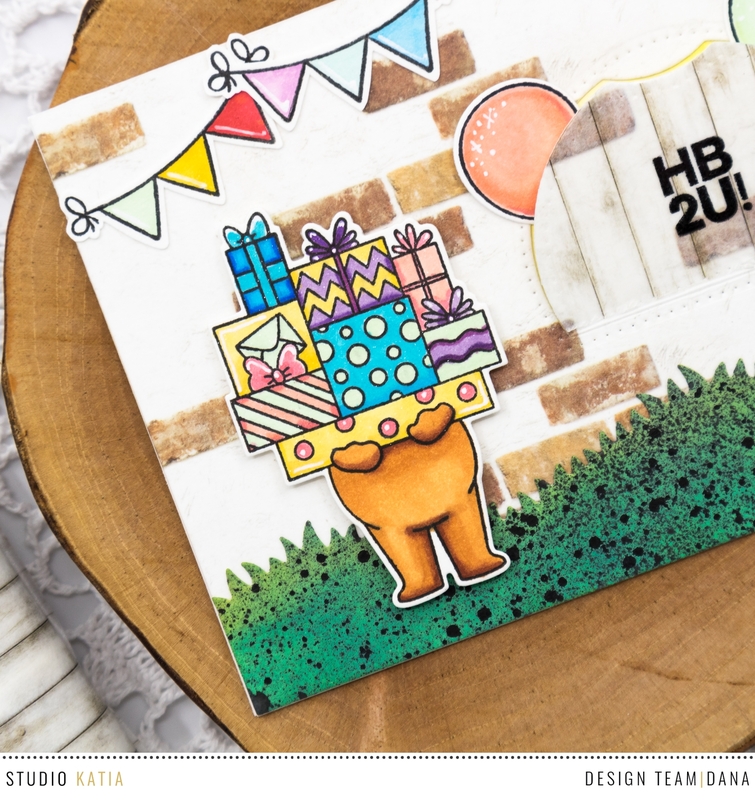 To start, I stamped bear and balloons from Studio Katia Kobi Bearing Gifts Stamp Set onto watercolor paper and colored with Altenew and Copic markers. For background, I mounted wide washi tapes I got from Daiso and ran it through die cutting machine with Studio Katia Scallop Window Die Set. I die cut grassy border from watercolor paper and ink blended it with Peeled Paint and Lucky Clover Distress Oxide inks as well. I then sprayed black ink as shown. Next, I stamped lion and garland images from Studio Katia Brithday Lions Stamp Set and colored with Copic markers and cut them with scissors. I pulled out Studio Katia Rose Gold Stars and let it aside to decorate around the lion. I sponged Fossilized Amber Distress Oxide Ink on an A2 sized white card base and stacked up all elements as shown in the picture. Before I adhered a lion inside the window, I stamped sentiment from Studio Katia Birthday Lion Stamp Set with StazOn Jet Black. Need more inspiration? I shared another Kobi birthday card on the Studio Katia blog today! Hope you stop by HERE and check out more details. I'm sharing a listed supplies I used today. I'm a part of Studio Katia affiliate program and if you shop through these links, I'll get a small commission without extra cost to you. Thank you in advance for your support. Your Kobi cards are fantastic, Dana! I'm especially crushing over the one you shared on the SK blog! That particular Kobi certainly has fine balance, navigating both a surfboard and his big ol' stack of gifts! Wonderfully creative! Aww heartfelt thanks for your lovely comment, Carol! You are so sweet!